Pakistan's former dictator Pervez Musharraf, who faces treason charges, has defended the country's previous military rulers, saying they have always brought the nation "back on track", while civilian governments derailed it. Musharraf, who toppled the civilian government of Nawaz Sharif in 1999 in a military coup, also claimed that the India policy of the ousted prime minister in his third tenure was a "total sell out", but did not explain what he meant by it. He said this in an interview to BBC Urdu, which was recorded in Dubai, where the 73-year-old has been staying since he left Pakistan in March 2016. He faces several charges, including treason for abrogating the Constitution and declaring emergency in 2007. 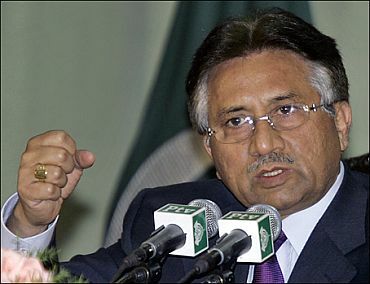 Musharraf has also been charged with involvement in the murder of two-time prime minister Benazir Bhutto in 2007. "Whoever works actively against the welfare of Pakistan is against the country and should be killed," he said in the interview. Musharraf, who served as Pakistan's president from 2001 to 2008, defended his "intervention" in 1999, saying he wanted to "save the nation". "The Constitution can be ignored if there is a need to save the nation," he said, without explaining the nature of the threat Pakistan faced at that time. He defended the military "takeovers" of the civilian governments in Pakistan, saying that real development occurred only during military regimes and accused the civil governments of reversing the progress achieved during military rules. "Military rule has always brought the country back on track, whereas civilian governments have always derailed it," he said. "Dictators set the country right, whereas civilian governments brought it to ruins." Last week after Sharif was ousted as prime minister after a Supreme Court ruling in the Panama Papers scandal, Musharraf posted a video on the social media hailing the verdict as "historic". He was criticised for the hypocritical remarks. On his return to the country, he appeared confident that the Pakistan Army would stand by him. "I have served as the head of the Army and the Army will always protect my welfare." He also held former Prime Minister Zulfiqar Ali Bhutto responsible for breaking up of Pakistan in 1971. He defended Gen Ziaul Haq's Afghanistan policy but agreed some of Haq's polices resulted in creating extremism.